22 July 2012: late afternoon UTC. I had to skip DM/BW-159 on my DM/BW-235, 233, 175, 176, 232, 193, 161 and 157 trip. 2 June 2013: To build up my activator score I planned another SOTA hopping day: DM/BW-195 -> 074 -> 168 -> 057 -> 845 -> 156 -> 157 -> 159. 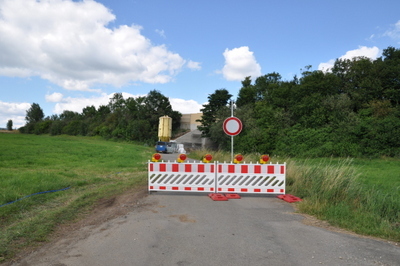 The direct road between DM/BW-057 and DM/BW-156 was closed in Öfingen and the detour allowed to add DM/BW-845. I left home at 05:00 local time and drove to DM/BW-195 and worked my way back towards HB9. This was the first dry day after a big rainfall. This weekend coincided with the IARU Region 1 Field Day in CW and since I am a FD adjudicator I decided to hand out some FD QSO in the morning on 40m and 20m and in the afternoon I worked on 30m and 17m for the SOTA chasers. 2 June 2013: 2nd time lucky. 2 June 2013: my shack in the activation zone. 22.07.2012: Just 1.4km before reaching my planned car park I was faced with a closed road. Instead of looking for a detour I decided to head to Osterberg, DM/BW-157 instead.